Mr Okundaye made these comments in the week (in May) when his wife Nike, the accomplished artist and cultural ambassador, clocked 61. “Nike, as you know, is a tireless woman, highly driven by humility and sincerity of purpose,” he adds, seated in a vast exhibition space on the first floor of the multi-story gallery. 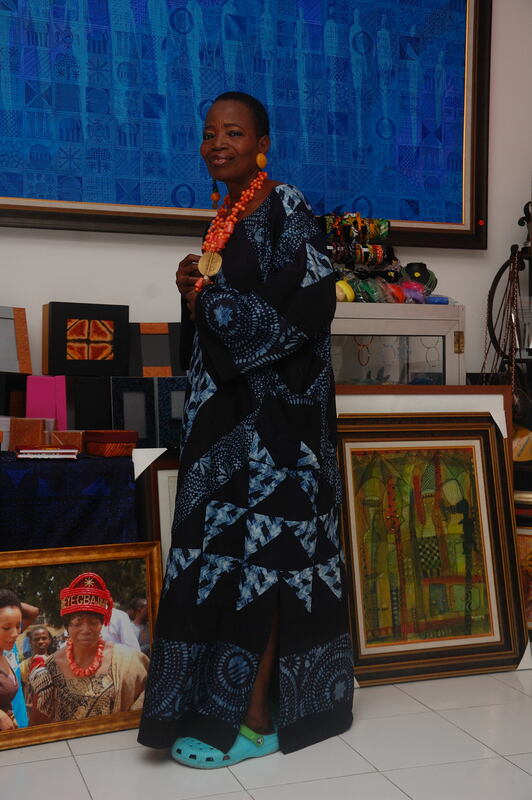 Two days earlier, on May 18, during the International World Museum Day celebrations at the Lagos National Museum, the Honourable Minister for Culture, Tourism and National Orientation Chief Edem Duke, had announced his appointment of Mrs Okundaye as a Special Adviser. It was an honour long overdue, though Mrs Okundaye is renowned abroad for her expertise in Adire print making, a constant fascination for western scholars. Mr Okundaye wondered why, with the continuous interest of the world in Nigeria’s artistic exports, government has turned ‘the blind eye’ to indigenous art all these years, instead investing all its energies to the exploitation of crude oil. For years, Nike Art Gallery has actively empowered the rural womenfolk (and youths) in Kogi State, Osun State and the federal capital, facilitating skills acquisition training in tie-and-die trade. Its impressive operational base in the Lekki axis of Lagos is a tourist attraction in itself, stocked from its ground floor up with tasteful local art.